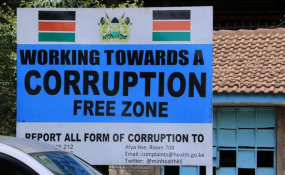 East Africa: Can the Region Sustain Its Promising Anti-Corruption Efforts? The arrest and prosecution of Kenya's second highest judge is the latest in a crackdown on high profile cases in the country's tough anti-corruption campaign. In 2016 Kenya reportedly lost about US$6 billion to corruption, an amount equal to a third of the country's annual state budget. The latest treasury records show high public debt at KES4.8 trillion - or US$48bn. In Tanzania and Somalia similar campaigns have led to the arrest of senior public officials. Throughout the region, graft has facilitated serious crimes such as trading in illegal arms, human trafficking, drug trafficking, cattle rustling, the smuggling of counterfeit goods and terrorism. Two international reports have accused Kenyan military units stationed in southern Somalia, as part of the African Union (AU) peacekeeping mission there, of facilitating the illegal charcoal trade and sugar smuggling. This illegal trade has been linked to funding for al-Shabaab, and occurs despite a 2012 United Nations (UN) ban on the charcoal trade. Some critics argue that anti-corruption campaigns are used to crack down on political opponents. Kenya’s Deputy Chief Justice Philomena Mwilu, who faces prosecution for tax evasion, claims that her arrest in August was politically motivated. Mwilu was one of the judges behind a supreme court ruling that nullified President Uhuru Kenyatta’s election win in August 2017. The judgment led to the first ever presidential election rerun in Kenya. In Tanzania, President John Magufuli has also been criticised for targeting opponents in his anti-graft war. Despite these allegations, some countries in the region - whose anti-corruption efforts began before the AU declared 2018 'African Anti-Corruption Year' - have achieved tangible results. In 2017 Transparency International's Corruption Perceptions Index showed that Rwanda is seen as the least corrupt country in the region, ranking 48th out of 180 countries, up from 50th in 2016. The index draws on views of experts and business people about levels of public sector corruption. Transparency International's scores place Rwanda and Tanzania ahead of Burundi, Ethiopia, Kenya, Somalia, South Sudan, Sudan and Uganda. Political leaders who are committed to fighting corruption seem to be the common denominator for success. Clément Musangabatware, Rwanda's deputy ombudsman in charge of preventing and fighting corruption, attributes the country's success in the fight against graft to strategies such as minimising direct contact with public procurement officials. The Transparency International index ranked Tanzania 103rd globally, an improvement on the previous two years. Magufuli's efforts appear to be paying off, despite criticism from political opponents. His anti-graft campaign has led to arrests of top state officials and those from the country's port and revenue authorities, and a shake-up in the civil service following high level sackings. Having all ratified the UN Convention Against Corruption, which is the only legally binding international instrument on corruption, most countries in the region have enacted domestic anti-graft legislation and set up institutions. Implementation, however, requires leadership. The recent show of political will and state commitment to active anti-corruption efforts in countries such as Kenya, Somalia and Ethiopia are encouraging. These states have also announced plans to investigate officials' foreign bank accounts. Anti-graft measures in Somalia have led to the arrest and dismissal of top government officials and probes into government spending for the first time since the 1990s. Kenya’s anti-corruption legislation and institutions date back to 1956 and 1993 respectively, but the country’s most recent anti-graft efforts have for the first time since independence seen senior government officials arrested and prosecuted. In recognition of the transnational nature of illicit financial flows caused by corruption, countries have signed agreements with partners outside the region. Examples include Kenya’s recent agreement with the UK which has seen Kenyan security officials visiting the UK in a bid to repatriate proceeds of corruption and crime. Kenya has a similar deal with Switzerland which aims to trace and recover stolen assets and funds stashed in Swiss accounts. Uganda has a memorandum of understanding with the EU and UK to strengthen its anti-corruption response. These efforts are laudable, and this type of cooperation should be extended within the region itself. National and regional anti-corruption efforts would show that the state can equitably distribute resources, improve service delivery and create an enabling environment for economic development. These efforts should be binding to enable the AU to impose sanctions or compel compliance by all member states. Measures like arresting and prosecuting senior state officials signal a strong intention to fight graft. However a sustained criminal justice response - which includes the consistent dismissal of corrupt officials, imprisonment of convicted suspects and recovery of proceeds from corruption - is needed for zero tolerance to be translated into real success.